Artool Freehand airbrush templates are an important creative tool for any airbrusher. Flex or curve them easily around irregular-shaped surfaces. These slick patterns, which were designed by Iwata's top artists, provide cutting edge imagery to give your projects a stylized look. They clean up easily with solvents, which will not damage the templates. Flame-O-Rama Mini Templates, Set of 4 — This set contains miniature 5" × 7" (13 cm × 18 cm) versions of the four Flame-O-Rama designs, including Flame Dango, Funkadelik, Ol' School, and Slash. Flame-O-Rama 2 Mini Templates, Set of 6 — This set contains miniature 5" × 7" (13 cm × 18 cm) versions of the six Flame-O-Rama 2 designs, including Classico, Fire Balz, Flamgasm, Van Flamin, Gothica, and Spots. Pirate Girlies Mini Templates, Set of 5 — This set contains miniature 5" × 7" versions of the five Pirate Girlie designs, including Girlie Chest, Girlie Girl, Mermaid Girl, Pirate Girl, and Shanghaied. Kanji Master Mini Templates, Set of 6 — This set contains miniature 5" × 7" versions of the six Kanji Master designs, including Dragon, Kanji Masks, Kanji Symbols, Koi Fish, Bamboo, and Tsunami Wave. Kustom FX 2 Mini Templates, Set of 6 — This set contains miniature 5" × 7" versions of the six Kustom FX 2 designs, including Dolla' Bill, Dragon Skin, Gear Head, Nutz N' Bolts, Puzzled, and The Blob. Kustom FX 3 Mini Templates, Set of 6 — This set contains miniature 5" × 7" versions of the six Kustom FX 3 designs, including Barby, Blades, Glyphs, Musika, The Web, and Unchained. Kustom FX 4 Mini Templates, Set of 6 — This set contains miniature 5" × 7" versions of the six Kustom FX 4 designs, including Classic Camo, Digital Camo, Fronds, Gator, Sraeg, and Wrenched. Kustom FX Mini Templates, Set of 6 — This set contains miniature 5" × 7" versions of the six Kustom FX designs, including Tiki Madness, Bullet Ridden, Cheetah Pimp, Diamond Plate, Cloud 9, and Brainiac. Kustom FX 3 Templates, Set of 6 — This set includes one each of Barby, Blades, Glyphs, Musika, The Web, and Unchained templates. Kustom FX 4 Templates, Set of 6 — This set includes one each of Classic Camo, Digital Camo, Fronds, Gator, Sraeg, and Wrenched templates. Flame-O-Rama 2 Templates, Set of 6 — This set includes one each of Classico, Fire Balz, Flamgasm, Van Flamin, Gothica, and Spots Flame-O-Rama 2. 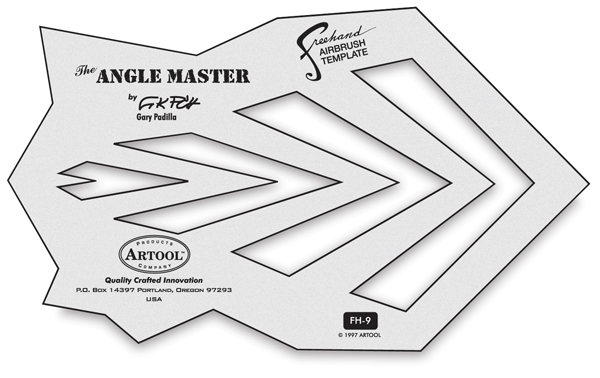 Templates measure approximately 8" × 11" (20 cm × 28 cm). Kustom FX 2 Templates, Set of 6 — This set includes one each of Dolla' Bill, Dragon Skin, Gear Head, Nutz N' Bolts, Puzzled, and The Blob templates. Kanji Master Templates, Set of 6 — This set includes one each of Dragon, Kanji Masks, Kanji Symbols, Koi Fish, Bamboo, and Tsunami Wave full size (8" × 11") templates. Flame-O-Rama Templates, Set of 4 — This set includes one each of Flame Dango, Funkadelik, Ol' School, and Slash Flame-O-Rama.Templates measure approximately 8" × 11" (20 cm × 28 cm). Kustom FX Templates, Set of 6 — This set includes one each of Tiki Madness, Bullet Ridden, Cheetah Pimp, Diamond Plate, Cloud 9, and Brainiac templates. 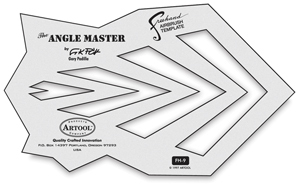 Flame Master Complete Templates, Set of 2 — The set includes one each of Flame Master Medium and Flame Master Multiple templates. Skullduggery Limited Edition Set — This sequentially numbered (1-500) set includes a signed certificate of authenticity. It comes in a top grain, black leather-etched binder that holds every Artool SkullMaster template ever designed by Craig Fraser, including his Limited Edition Skullduggery Template. Curse of SkullMaster Mini Templates, Set of 5 — This set contains miniature 5" × 7" versions of the five Curse of SkullMaster designs, including Bonz II, Buccaneer, Evil Horde, Petting Zoo, and Voo Doo. Return of SkullMaster Mini Templates, Set of 4 — This set contains miniature 5" × 7" versions of the four Return of SkullMaster designs, including Frontal II, Multiple II, Screamin' II, and Lucky 13. Son of SkullMaster Mini Templates, Set of 4 — This set contains miniature 5" × 7" versions of the four Son of SkullMaster designs, including Devil or Angel, Menagerie, Nite & Day, and The Bonz. Wrath of SkullMaster Mini Templates, Set of 6 — This set contains miniature 5" × 7" versions of the six Wrath of Skull Master designs, including Kalaveras, Bonz III, Burial Ground, Mr. Potato Bonz, Mr. Potato Bonz Stuph #1, and Mr. Potato Bonz Stuph #2. Horror of SkullMaster Mini Templates, Set of 3 — This set contains miniature 5" × 7" versions of the three Horror of SkullMaster designs, including Heads Up, The Scream, and Profile. Curse of SkullMaster Templates, Set of 5 — This set includes one each of Bonz II, Buccaneer, Evil Horde, Petting Zoo, and Voo Doo templates. Son of SkullMaster Templates, Set of 4 — This set includes one each of Devil or Angel, Menagerie, Nite & Day, and The Bonz templates. Return of SkullMaster Templates, Set of 4 — This set includes one each of Frontal II, Multiple II, Screamin' II, and Lucky 13 designs. Horror of SkullMaster Templates, Set of 3 — This set includes one each of Heads Up, The Scream, and Profile templates. Wrath of SkullMaster Templates, Set of 6 — This set includes one each of Kalaveras, Bonz III, Burial Ground, Mr. Potato Bonz, Mr. Potato Bonz Stuph #1, and Mr. Potato Bonz Stuph #2 templates. SkullMaster Templates, Set of 3 — This set includes one each of The Frontal, The Multiple, and The Screaming templates. True Fire Nano Templates, Set of 3 — This set includes three Nano-sized Fireball templates, all measuring approximately 2" × 3½" (5 cm × 8.8 cm). Cut the tiny connecting tabs on each to reveal six different positive/negative shapes. True Fire Templates, Set of 3 — This set includes three templates (Diablo, Inferno, and Wildfire). Cut the tiny connecting tabs on each to reveal 18 different positive/negative shapes. All templates measure approximately 8" × 11" (20 cm × 25 cm). The set also includes a bonus DVD, featuring 37 minutes of instruction on Lavallee's True Fire technique. True Fire Mini Templates, Set of 3 — This set includes three templates (Fireball A, Fireball B, and Fireball C), which all measure approximately 5" × 7" (13 cm × 18 cm). Cut the tiny connecting tabs on each to reveal six different positive/negative shapes. The set also includes a bonus DVD, featuring 25 minutes of instruction on Lavallee's True Fire technique. True Fire II Templates, Set of 3 — This set includes three templates — Blaze, Fireball, and Pyro. Cut the tiny connecting tabs on each to reveal 21 different positive/negative shapes. All templates measure approximately 8" × 11" (20 cm × 25 cm).